MOSCOW (Sputnik) - A number of companies, including beauty giant L'Oreal and luxury goods LVMH company, banks and powerful businessmen on Tuesday pledged to donate some 700 million euros ($790 million) to restore the medieval Notre Dame cathedral that had been severely ravaged by the blaze. L'Oreal, the world's largest cosmetics company, along with the Bettencourt Meyers family, announced that it would donate 200 million euros. The company said that it was "touched by the drama that brought together cultures and beliefs" in a statement released on its website. The same sum was pledged by French billionaire businessman Bernard Arnault’s family and his LVMH luxury goods company, according to the statement on Twitter. Artemis, a French holding company, owned by prominent businessman Francois-Henri Pinault, promised to donate 100 million euros. "This tragedy struck all the French and far beyond, [it affected] everyone who is attached to spiritual values," Pinault stressed. Total oil and gas giant also made a donation of 100 million euros for the reconstruction of the centuries-old cathedral. "Fluctuat nec mergitur ['rocked [by the waves], but does not sink,' the Latin motto of Paris]," the company's CEO, Patrick Pouyanne, tweeted. French banks also made donations to the restoration of the cathedral. According to French media, the biggest contributions were made by Societe Generale, a French multinational investment bank and financial services company, and BPCE banking group. Both donated 10 million euros each. JCDecaux Group, a multinational corporation known for its bus-stop advertising systems, also joined the choir by pledging 20 million euros to restore the heart of Paris. Paris Mayor Anne Hidalgo announced the release of 50 million euros to restore the renowned cathedral. Valerie Pecresse, president of the Ile-de-France region, in which Paris is located, promised to release 10 million euros in "emergency aid to help the [Paris] archdiocese to do the initial work." The landmark Gothic cathedral located in the heart of the French capital caught flames on Monday evening. 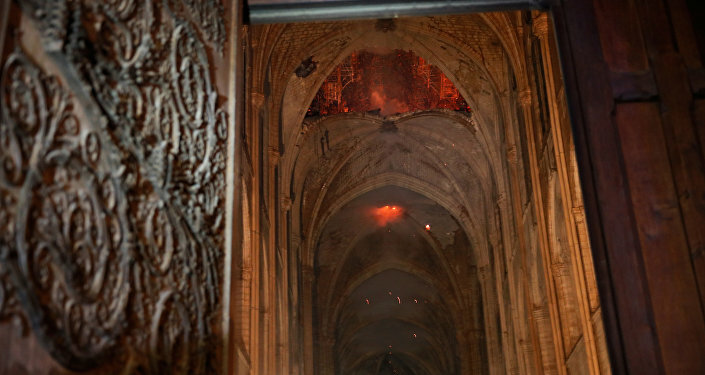 The building was heavily damaged in the blaze and two-thirds of the cathedral's wooden roof were destroyed in the fire. The main spire and clock collapsed, but the two main towers were saved.